Transform into the leader of the Autobots when you go in this mens authentic Optimus Prime costume! This Transformers costume for adults starts off with the detailed jumpsuit. The jumpsuit has screenprinted details from head start to finish, making it look like sophisticated machinery. The back of the jumpsuit has Velcro and a zipper for ease. There are many polyfoam elements to give the costume some bulk and look mechanical, such as on the shoulders, upper arms, and lower legs. The chest too is covered in polyfoam to give a bulky appearance. The jumpsuit hands are completely covered as gloves. The plastic armor then attaches to the jumpsuit. The chest piece looks like the front of a semi-truck, with clear windshield detail. The hip accessory acts as a codpiece, and is detailed with silver and copper paint job. The plastic gauntlets are half pieces that attach to the forearm. These pieces are red with blue flames painted on. The sword attaches to the arm, under the gauntlet. This sword is made of durable plastic and looks just like the one seen in the film, with a weathered yellow blade and runes. The helmet is the crowning piece of this Transformers icon. The helmet is made in several pieces which all come together and attach with Velcro. The helmet is painted to look just like Optimus, and even sports blue, light-up eyes (batteries included!). 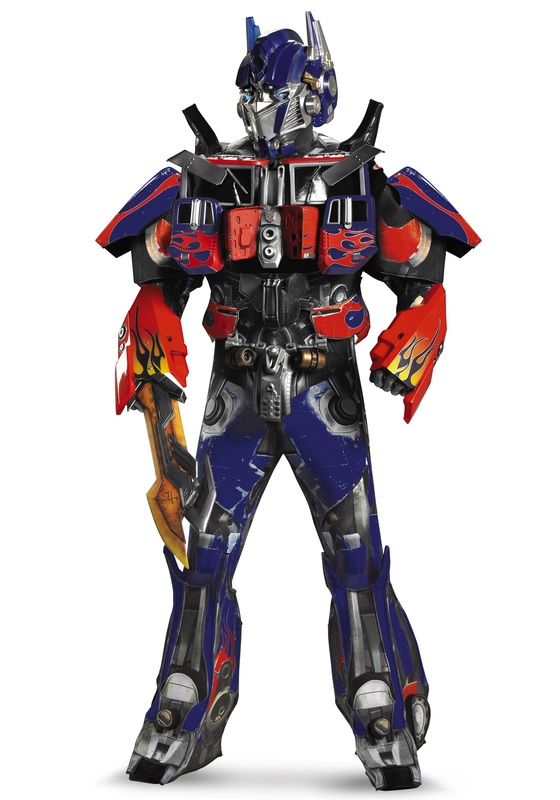 Become a robot in disguise with our realistic Optimus Prime costume!